2This paper examines how successive military regimes in Nigeria have managed transition programmes. It will describe the historical and legal framework of military-managed transition, the performance of the military and the role of other government and civil society institutions (in particular, the legal system and the judiciary), in the politics and process of transition in Nigeria. 3The paper is divided into six parts. The first part traces the entry of the military into government in Nigeria in January 1966 until 1975, while the second examines the structure of the transition programme that led to the successful election of a civilian president in October 1979. In the third part, the aborted General Ibrahim Babangida transition programme to civilian government is described. Part four examines the role that civil society structures were allowed to play in these programmes of transition and, in part five, the paper considers the role played by the judiciary in the transition processes. The final and concluding part gives a prognosis of the transition programme of the present regime of General Sani Abacha. 4The first military government in Nigeria was installed in January 1966 after a partially successful coup on 15 January 1966. This coup was led by a group of middle-rank officers of the Nigerian Armed Forces, and effectively ended the ‘broad-based’ national government led by the Northern People’s Congress (NPC), which was installed after the controversial federal elections held from December 1964 to March 1965.4 The coup was most successful in the Northern Region where its leaders succeeded in taking temporary control of government. They also assassinated the Prime Minister, Sir Abubakar Tafawa Balewa, the regional premiers of the Northern and Western Regions, Alhaji Ahmadu Bello and Chief S.L. Akintola, respectively, and some other leading politicians including the federal finance minister. In the three other regions – the Eastern, Mid-Western and Western Regions – the coup was only partially successful. The General Officer Commanding the Nigerian Army (GOC), Major-General Aguiyi-Ironsi, who was to have been arrested by the coup leaders, managed to evade arrest and successfully mobilized loyal forces to resist the coup in other parts of the country. 5 Government Notice no. 147 of 26 January 1966. ... had tonight been advised by the council of ministers that they had come to the unanimous decision to voluntarily hand over the administration of the country to the Aimed Forces of the Republic with immediate effect.5 He expressed the hope that the administration ‘will ensure the peace and stability of the Federal Republic of Nigeria and that all citizens will give them their full cooperation’. 6 Government Notice no. 148 of 26 January 1966. 12 B.J. Dudley, Instability and Political Order (Ibadan:University of Ibadan Press, 1974). 9The Aguiyi-Ironsi regime set up some constitutional bodies which gave the impression that it contemplated a swift return to an elected, civilian government.12 However, the regime was shortlived. In a counter-coup on 29 July 1966, the administration was overthrown and its head, General Johnson Aguiyi-Ironsi was assassinated. The new regime of Lieutenant-Colonel (later General) Yakubu Gowon initiated a process of constitutional revision. Shortly after assuming power, it constituted an ‘ad hoc conference on constitutional proposals for Nigeria’, ‘a gathering of old hands adept at political bargaining’13 which began meeting in September 1966. 10On 24 October 1966, following renewed inter-ethnic violence, which resulted in the killing of large numbers of Igbo people (of south-eastern Nigeria) in some parts of the Northern Region, the delegation of the Eastern Region to the Ad Hoc Conference walked out, effectively ending the work of the conference. 11The crisis in the country continued to escalate. Ostensibly to reduce the concentration of power in the North and dampen the rumblings of secession in the Eastern Region in particular, the Gowon regime dissolved the regional structures and created 12 states in their place.14 Shortly afterwards, the country became embroiled in a civil war which ended formally on 15 January 1970. 12Many politicians in Nigeria expected that the Gowon regime would announce a programme to return the country to an elected civilian government shortly after the end of the war. Addressing the country on the 1O th anniversary of Nigeria’s independence on 1 October 1970, General Gowon announced a six-year transition plan to return the country to an elected government in 1976; the intervening period was dedicated to a programme of reconstruction, rehabilitation, reconciliation and reintegration (better known as ‘the four Rs’). However, in another nationwide broadcast on 1 October 1974, General Gowon announced that the 1976 date was ‘unrealistic,’ however he failed to announce a new date. 14The transition programme announced by the regime of General Murtala Muhammed was preceded by a major debate in the Nigerian media. The debate began with the announcement that the regime intended to implement a speedy transition to civil rule. Two major subjects of debate were, (a) the length of time that such a programme should take, and (b) the main activities to be included in it. 17Following the submission of the report of the CDC in September 1976, an elected constituent assembly (CA), headed by two senior judges of the Nigerian Supreme Court, was constituted to debate the draft constitution. Neither body, however, had the power to adopt the constitution, a prerogative that the regime reserved for its highest decision-making organ, the Supreme Military Council. 18The CA met between October 1977 and June 1978 and ratified the recommendations of the CRC for a federal, presidential system of government modelled on the American system. This was to include a bicameral legislature at the federal level, a unicameral legislature at the state level, and a four-year tenure for elected officials at both the federal and state levels. It also backed the recommendation of a multi-party system, separation of powers between the arms of government, a division of powers based on a system of enumerated powers for the federal government, mostly residual powers for the states and an enforceable ‘Bill of Rights’. 20 See Section 6(6)(6) of the Constitution of the Federal Republic of Nigeria 1979. 19The draft constitution which the CA submitted to the Federal Military Government suffered 17 amendments by the time it was finally promulgated by the regime in 1979. Perhaps the most significant amendment was a provision20 which rendered the acts and legislation of all the military regimes in Nigeria since 1966 immune to legal challenge under the new dispensation. 21 See States (Creation and Transitional Provisions) Decree no. 12 of 1976. 20Meanwhile, in February 1976, the regime created six new states, bringing the number of states in Nigeria to 19.21 Shortly after this, General Mohammed was assassinated in a failed coup attempt and was succeeded by his deputy, General Olusegun Obasanjo, as Head of State. Following a reorganization of the local government system,22 the regime conducted the first set of elections under its transition programme – the local government elections – on a zero-party basis in December 1976. Responsibility for organizing these elections was given to the respective state administrations; ten of these conducted the elections by direct method while the other nine used the indirect method. ... as a transitional measure, the Supreme Military Council should appoint for the purpose of the first election before return to civil rule, an Electoral Commission. That Commission is to be disbanded after the first election. 25 Decree no. 41 of 1977; hereafter called FEDECO Decree. 29 Decree no. 73 of 1977. 30 Decree No. 32 of 1978. 24In December 1977, the regime promulgated the Electoral Decree,29 after the establishment of FEDECO, but before the CA had completed its deliberations on the report of the CDC. The decree has 6 chapters and 151 sections, and contained the powers, procedures and dispute resolution mechanisms for the conduct of all elections. It dealt with matters such as registration of voters, procedure of elections, penal provisions relating to electoral offences, the formation and registration of political parties and dispute resolution mechanisms relating to (legal) proceedings on the validity of elections. The decree was subsequently amended by the Electoral (Amendment) Decree30 partly to reflect the outcome of the work of the CA. 25Together, the FEDECO and the electoral decrees were the legislative bases for the conduct of the Murtala/Obasanjo transition programme. It is fair to say that, with a few exceptions, FEDECO enjoyed reasonable administrative independence under both statutes. One of such exceptions was contained in Section 16(1) of the electoral decree by which the regime reserved for itself the prerogative to decide on the dates for all the elections into elective state and federal positions. 31 Section 82, Electoral Decree. 37 Section 73, Electoral Decree. 38 Section 74(2), Electoral Decree. 30Each of the registered parties was a reincarnation of the political affiliations from the previous civilian government which was overthrown in 1966 and drew its leadership from the leading political figures of that era.43 The Obasanjo regime faithfully completed its transition programme which culminated in the inauguration of an elected civilian, President Shehu Shagari, albeit in controversial circumstances44 on 1 October 1979, when the new constitution also came into force. 47 The commission was headed by Justice B.O. Babalakin. 37The Committee of Eight submitted its report in March 1986, and identified several priority issues for the regime to address. These included economic stabilization and growth, restructuring the economy for growth, the establishment of new states, religious issues, penal reform and the judicial process, education, the national census, police and national security, the public service and language. The committee rejected the presidential system of government, suggesting instead ‘a modified parliamentary system of government based on the principle of power sharing’ between the army and elected civilians in which ‘sensitive’ portfolios such as defence, internal affairs and information, would be reserved for the military.54 The work of this committee has never been published. 55 Report of the Political Bureau. (Lagos: Federal Government Printer, 1987). 38The Politburo identified 30 priority areas on which it took submissions. Although framed differently, these issues included all those identified by the Committee of Eight. In addition, there were items like human rights, women in politics, political parties, rural and community development, revenue allocation, ethnicity, federalism, youths and students in politics and national minorities. The bureau submitted its report on 27 March 1987.55 In its report, the bureau recommended the implementation of ‘a broadly spaced transition in which democratic governance can proceed with political learning, institutional adjustment and a reorientation of political culture, at sequential levels of politics and government and ending at the federal level.’ While the majority of members of the bureau recommended a transition programme that would terminate with the hand-over of power to an elected civilian regime in September/October 1990, a minority recommended a five-year programme to end in 1992. 57 Decree no. 19 of 1987. 40The implementation of the transition programme of General Babangida relied heavily on the force of military decrees. In contrast to the transition programme of 1976-1979 which was regulated by two basic laws, General Babangida promulgated 57 decrees containing a total of 1,174 sections to govern the transition programme between 1986-1992.59 As a result, the process of implementing these laws (and their amendments) was often confusing. The survey below only covers some of the significant transition decrees. 41General Babangida’s political programme was promulgated in Decree no. 19 of 1987. This decree originally outlined a programme of transition, scheduled to begin in the third quarter of 1987, with the establishment of a Directorate of Social Mobilisation, a National Electoral Commission (NEC) and a Constitution Drafting Committee (later established as the Constitution Review Committee, CRC) in the third quarter of 1987. In addition, the programme listed in six schedules, an itemized timetable of 19 other activities and measures to be implemented during the transition period. These included local government elections on a zero-party basis in the last quarter of 1987, the termination of the structural adjustment programme (SAP) and the consolidation of its gains in 1988, the lifting of the ban on politics and the registration of two political parties in 1989, the inauguration of elected state governments in 1990, the conduction of a national census in 1991 and the inauguration of a new president in 1992. 61 Section 14 of the decree. ... the validity of any decision, sentence, judgement, confirmation, direction, notice or order given or made, as the case may be, or any other thing whatsoever done under this decree shall not be inquired into in any court of law. 62  Nigerian Weekly Law Reports (Part 192) 458 at p. 472. 43This clause was described by the Court of Appeal in the case of the National Electoral Commission v. Nzeribe as ‘the most far reaching to be found in any decree since the inception of military rule in this country.’62 This decree was subsequently amended at least seven times63 and the terminal date of the transition changed four times, eventually to 27 August 1993. 64 See National Electoral Commission Decree no. 23 of 1987. 68 Decree no. 8 of February 1989. 70 Decree No. 37 of 1987. 75 Decree no. 25 of 1987. 77 Participation in Politics and Elections (Miscellaneous Provisions) Decree no. 48 of 1991. 49The minimum age for participation in transition politics was put at 18.80 The regime also constituted a Constitution Review Committee in 1987, and in April 1988, set up a Constituent Assembly to deliberate upon the work of the CRC. The CA completed its work in May 1989.81 Like similar bodies which were set up under the Obasanjo regime, the final decision on the contents of the constitution lay with the Armed Forces Ruling Council. 50In December 1989, after it had refused to recognize any of the six82 political associations recommended to it for registration by NEC, the regime promulgated decrees83 to set up and regulate the operations of the two political parties, the National Republican Convention (NRC) and the Social Democratic Party (SDP), the latter being ‘a little to the left’ and the former ‘a little to the right’ of the ideological spectrum. 85 See the States (Creation and Transitional Provisions) Decree no. 24 of 23 September 1987. 88 State Government (Basic Constitutional and Transitional Provisions) Decree 1991. 89 National Assembly (Basic Constitutional and Transitional Provisions) Decree no. 53 of 1992. 90 Awa U. Kalu, The democratization of Nigeria..., 52. 91 No. 13 of 26 February 1993. 92 See Transition to Civil Rule (Political Programme) (Amendment) (no. 3) Decree no. 52 of 1992. 96 Cited in Tunji Olagunju, et al., Transition to Democracy..., 96-97. 55One means through which the military has sought to achieve these objectives is through intelligence services which have always played a major role in the management of transitions to civil rule in Nigeria. One of the first moves of the regime of General Obasanjo was to set up a Nigerian Security Organisation (NSO). 98 Tunji Olagunju, et al., Transition to Democracy..., 96. 100 ibid., sections 4(1) and 5(l)(a). 101 Tunji Olagunju et al., Transition to Democracy..., 96-97. 57The Murtala Mohammed/Obasanjo regime took firm steps to control certain sectors of the Nigerian civil society during its transition programme. Although human rights and pro-democracy NGOs did not come into existence as such until during the regime of General Babangida, organized groups such as the labour unions, those formed by university lecturers and students and professional organizations actively monitored and debated the policies of the regime. 105 See Trade Disputes Decree no. 7 of 1976 now Cap. 432, Laws of the Federation, 1990. 107 Trade Unions (Central Labour Organization) (Special Provisions) Decree no. 44 of 1976. 110 Trade Disputes (Essential Services) Decree no. 23 of 1977, Section 3(1). 113 Section 8(1) and (2). 114 Nigerian Labour Congress (Proscription) Decree no. 22 of 1988. 115 Trade Unions (Miscellaneous Provisions) Decree no. 25 of 1989. 117 Trade Unions (International Affiliation) Decree no. 35 of 1989. 120 Section 4(1), Students Union Activities (Control and Regulation) Decree no. 47 of 1989. 121 Trade Unions (Miscellaneous Provisions) Decree no. 17 of 1986. 62The judiciary has always played a major role in successive programmes of transition to civil rule in Nigeria by adjudicating disputes and election petitions.123 Successive military regimes have always sought to limit and control the powers and relevance of the judiciary in the regulation of transitions. Thus, all military decrees regulating transition contain clauses ousting or severely limiting legal proceedings affecting the transition process except with respect to election petitions. 124 Section 146, Electoral Decree, 1977. 125 (1979), 3 Law Reports of Nigeria, 286, p. 305. 64In the same vein, the Babangida regime set up a parallel tribunal (which included one military officer) to regulate its transition programme and completely exclude the regular courts from having any say in it. In the case of Resident Electoral Commissioner for Anambra State v. Nwocha,126 the Nigerian Court of Appeal held that with or without an ouster clause, the regular courts lacked jurisdiction to adjudicate on electoral matters arising out of the transition. 129 Oyeleye Oyediran, Presidential elections result controversy. The Nigerian 1979 Elections, 144-145. 131 B.O. Nwabueze, Nigeria 93: The Political Crisis and Solutions, 41. 133  3 Nigerian Weekly Law Reports (Pt. 302) 692. 68The annulment of the elections plunged the country into a political crisis. In the case of Attorney-General of Anambra State & 13 Others v. Attorney-General of the Federation & 16 Others,133 14 states of the federation initiated proceedings before the Supreme Court of Nigeria, seeking to nullify the annulment and compel the regime to complete the transition by declaring the final results of the presidential elections. In its decision delivered on 13 September 1993, the Supreme Court declined jurisdiction to hear the suit holding that by virtue of the monolithic command structure of the military, the states could not sue the federal government under a military regime! 134 Constitution (Suspension and Modification) (Repeal) Decree no. 59 of 1993. 135 Interim Government (Basic Constitutional Provisions) Decree no 61 of 1993. 138 Constitution (Suspension and Modification) Decree no. 107 of 1993. 139 Transition to Civil Rule (Political Programme) Decree no. 1 of 1996. 140 National Electoral Commission (Establishment, etc.) Decree no. 3 of 1996. 141 The scramble for politics. West Africa Magazine (29 July-4 August, 1996): 1178-1181. 70On assumption of power in 1993, General Abacha abrogated the limited structures of civil rule instituted by the Babangida regime and returned the country to full military rule.138 In 1994, he set up a constitutional conference which completed its work in mid-1995. Early in 1996, General Abacha released a multiple-phase, political programme designed to return the country to civil rule in October 1998. Elements of the programme included the creation of more states and local governments, local elections on a zero-party basis, lifting of the ban on political activities, formation of parties, phased elections on party basis into elective local, state and federal positions, resulting finally in the hand over of power to an elected civilian president and the disengagement of the armed forces from power on 1 October 1998.139 In January 1996, the regime gave legal backing to a National Electoral Commission of Nigeria (NECON).140 In March 1996, it organized zero-party local elections and in July began a process to register political parties.141 In its essential aspects, the programme repeats the transition sequence introduced by General Babangida. 144 See Ogaga Ifowodo, 177-178. 145 Nigeria: Pushing Abacha Africa Confidential (vol. 36, no. 17): 3. 73A sustainable transition process will clearly need to find a formula for addressing -August 30, 2001 and resolving – the potentially explosive tensions which still exist as a result of the annulment of the 1993 presidential election. Unless this is done, any new civilian government will be built on fragile foundations which may undermine its ability to forestall the return of the military – and lead to yet another transition! Achike, Okay. Groundwork of Military Law and Military Rule in Nigeria. (Fourth Dimension Publishers, Enugu, 1987). Ali, Sidi. H. Murtala Muhammed: A betrayed revolutionary. 1983. Buhari, Muhammadu. Moment of Truth: Collected speeches. (Government Printer, Lagos, 1994). Civil Liberties Organization (CLO). Executive Lawlessness in the Babangida Regime. (Civil Liberties Organization, Lagos, 1991). Civil Liberties Organization (CLO). Report on the Local Government Elections of December 8, 1990. (Lagos, December 1990). Dudley, B.J. Instability and Political Order. (Ibadan University Press, Ibadan, 1974). Federal Republic of Nigeria, Reports of the Constitution Drafting Committee Containing the Draft Constitution, volume II. (Federal Ministry of Information, Printing Division, Lagos, 1976). Gahia, Chukwuemeka. Human Rights in Retreat: A report of the human rights violations in Nigeria. (Civil Liberties Organization, Lagos, 1990). Gboyega, A.E. The making of the Nigerian Constitution. In: Nigerian Government and Politics under Military Rule, 1966 -1979, Oyeleye Oyediran, ed. (Macmillan Press, London and Basingstoke, 1979). Human Rights Watch (vol. 6, no. 8, 1994). Ifowodo, Ogaga. Annual Report on Human Rights in Nigeria 1993. (Civil Liberties Organization, Lagos). Jinadu, Adele. L. The Federal Electoral Commission. In: The Nigerian 1979 Elections. O. Oyediran, ed. (Macmillan, London and Basingstoke, 1981). Kalu, Awa U. The democratization of Nigeria: More bullet(s) or ballots? Lawyers Biannual (vol.1, no.1, June 1994). Mustapha, Abdul Raufu. The state of academic freedom in Nigeria In: The State of Academic Freedom in Africa. (CODESRIA, Dakar, 1996). National Electoral Commission. Views of the federal military government on the report of the Judicial Commission of Inquiry into the affairs of the Federal Electoral Commission (FEDECO) 1979-1983. In: National Electoral Commission (NEC), Transition to Civil Rule, Laws and Materials on the Electoral Process (Federal Government Printer, Lagos, 1990). Nigerian Weekly Law Reports (Part 302) 692. Nwabueze, B.O. Nigeria 93: The political crisis and solutions. (Spectrum Books, Ibadan, 1994). Nwabueze, B.O. A Constitutional History of Nigeria. (Christopher Hurst and Company, London, 1981). Nwosu, H.N. Keynote address. Chairman of the National Electoral Commission (NEC), at the Biennial Law Week of the Nigerian Bar Association, Lagos, (12 February 1990). In: Transition to Civil Rule: Laws and Materials on the Electoral Process. (National Electoral Commission, Lagos). Ojo, J.D. Students Unrest in Nigerian Universities: A legal and historical approach. (IFRA and Spectrum Books, Ibadan, 1995). Ojo, J.D. Law and University Administration in Nigeria (Malthouse Law Series, Lagos, 1990). Ola, B.O.F. The recent local government reforms: Advent of a new federal-state-local government relations. In: The New Local Government System in Nigeria: Problems and prospects for implementation. L. Adamolekun and L. Roland, eds. (Heinemann Educational Books, Ibadan, 1979). Olagunju., Tunji, Adele Jinadu and Sam Oyovbaire. Transition to Democracy in Nigeria. (Safari Books (Express) with Spectrum Books, Ibadan, 1993). Olanrewaju, Ayo. The Bar and the Bench in Defence of Rule of Law in Nigeria. (Nigerian Law Publications, Lagos, 1992). Oyediran, Oyeleye. The road to the 1979 elections. In: The Nigerian 1979 Elections. Oyedele Oyediran, ed. (Macmillan, London and Basingstoke, 1981). Oyediran, Oyeleye. Political parties: Formation and candidate selection. In: The Nigerian 1979 Elections. Oyeleye Oyediran, ed. (Macmillan, London and Basingstoke, 1981). Portrait of a New Nigeria: Selected speeches of IBB. (Precision Press, date unstated). Sagay, Itse. Dissappearing act: Nigeria’s bumpy road to democracy. Liberty (vol. 4, no. 1, April, 1994). Tokunbo, M.A. Labour Movement in Nigeria: Past and present. (Literamed Publications, Lagos, 1985). Towards Civil Rule: Speeches of His Excellency, Lt. General Olusegun Obasanjo in preparation for changing over to civilian government in 1979. (Federal Ministry of Information, Lagos, 1978). African Guardian (31 July 1989): 16. Sunday Times (29 January 1984): 11. Nigeria: Widening the net. Africa Confidential (vol. 36, no. 14). The scramble for politics. West Africa Magazine (29 July – 4 August, 1996). Nigeria: Pushing Abacha. Africa Confidential (vol. 36, no. 17). 1 The 1989 Constitution drafted under the auspices of the Babangida regime was abrogated before it was formally promulgated following the annulment of the presidential elections of June 1993. See, Attorney-General of Anambra State & Others v. Attorney-General of the Federation & Others,  Nigerian Weekly Law Reports (Part 302): 692. 2 With the notable exception of the regime of Major-General Muhammadu Buhari, every military regime in Nigeria has evinced an intention to design and implement a programme of transition to an elected civilian government. See, Awa U. Kalu, The democratization of Nigeria: More bullet(s) or ballot? Lawyers Biannual (vol. 1, no. 1, June 1994): 40. 3 It is widely believed that the claim (in early 1995) by the present regime to have foiled a coup attempt against it by a group allegedly made up of middle ranking army officers without command positions, retired generals, civilian pro-democracy activists and journalists was not credible. Africa Confidential, for instance, reported that ‘there is new concern that human rights activists ... and independent journalists ... will be roped into a secret treason trial held under military rule. Such reports confirm that the tribunal is purging dissidents rather than trying plotters.’ See: Nigeria: Widening the net, Africa Confidential (vol. 36, no. 14): 8. 4 The elections were contested between the Nigerian National Alliance (NNA) made up primarily of the Northern Peoples’ Congress (NPC), the Nigerian National Democratic Party (NNDP) and some other minor parties on the one hand, and the United Progressive Grand Alliance (UPGA) – constituted mainly by the Action Group (AG), the National Council of Nigerian Citizens (NCNC) and the Northern Progressive Front (NPF) which was itself formed in 1964 by a coalition of four small, left-of-centre political parties from the Middle Belt and North-Central Nigeria – on the other. The parties of the NNA won a total of 198 seats in the Federal Parliament as against 109 by the UPGA. The NPC alone won 162 seats to become the largest single party in Parliament. Subsequently, the NCNC deserted the Grand Alliance to join the NPC-led Federal Government. 7 See, Lakanmi v. Attorney-General (West) SC. 58/69 of 24 April 1970, [ 1974 ] East Central State Law Reports, 713. 8 Okay Achike, Groundwork of Military Law and Military Rule in Nigeria. (Enugu: Fourth Dimension Publishers, 1978); B.O. Nwabueze, A Constitutional History of Nigeria. (London: C. Hurst and Company, 1981): 161 et. seq. 9 Subsequent military regimes in Nigeria also professed to be corrective and temporary. Addressing the Conference of Attorneys-General in Abuja, Nigeria, on 9 September 1991, the then President, General Babangida put forward what he called the ‘custodian theory of military intervention in our body politic’, in which he justified occasional military intervention in Nigerian politics as necessary from time to time in order to restore sanity to national politics. He argued that such intervention was justifiable provided it was ‘temporary and corrective’. 11 ibid. The regime promptly nullified the effect of this decision through the Federal Military Government (Supremacy and Enforcement of Powers) Decree no. 28 of 1970, which declared the takeover of government in 1966 to be a ‘revolution’ that had the effect of destroying the pre-existing legal order. 13 A.E. Gboyega, The making of the Nigerian Constitution. In: Nigerian Government and Politics under Military Rule, 1966-1979. Oyeleye Oyediran, ed. (London: Macmillan Press, 1979): 240. 14 The idea of state creation was one of two proposals first tabled during the 1957 Constitutional Conference (preceding Nigeria’s independence) by the Action Group delegation (led by Chief Obafemi Awolowo) ostensibly to diminish the perceived dominance of the Northern Peoples’ Congress and dilute the political arithmetic in the Northern Region. The other proposal suggested the entrenchment in the Constitution of a set of fundamental rights. In the absence of a consensus from the Nigerian delegation(s) on the issue of state creation, the conference agreed that ‘a Commission of Enquiry should be appointed to ascertain the facts about the fears of minorities in any part of Nigeria and to propose means of allaying these fears whether well or ill-founded ... The Commission would be empowered as a last resort to make detailed recommendation for the creation of one or more new states, specifying the areas to be included and the governmental and administrative structure most appropriate.’ See Cmnd. 207 (1958), p. 13. The Willinck Commission (named after Sir Henry Willinck, the Chair of the Commission) which was set up under this resolution failed to recommend state creation. 15 Oyeleye Oyediran, The road to the 1979 elections. In: The Nigerian 1979 Elections, Oyeleye Oyediran, ed. (London and Basingstoke: MacMillan Press, 1981): 9-10. 17 Chief Awolowo, for instance, thought that a two year programme terminating in March 1977 would be sufficient, while another leading politician, Chief Sam Grace Ikoku argued in favour of a five-year, five-stage transition programme ending on 1 October 1980. 18 The Supreme Military Council (SMC) was the highest law and decision making organ under the regime. It was made up primarily of the head of state and his deputy (then known as the chief of staff, Supreme Headquarters), the (military) service chiefs, the inspector general of police and the state military governors. See, The Constitution (Basic Provisions) Decree no. 32 of 1975. 19 For a text of the address of General Mohammed to the inaugural session of the CDC, see Sidi H. Ali, Murtala Mohammed: A betrayed revolutionary, 1983, 106-113. 22 For a description and analysis of the nature and consequences of the reform of local governments undertaken by the regime, see B.O.F. Ola, The recent local government reforms: Advent of a new federal-state-local government relations. In: The New Local Government System in Nigeria: Problems and pospects for implementation, L. Adamoiekun and L. Roland, eds. (Ibadan: Heinemann Educational Books, 1979): 15-34. 23 Federal Republic of Nigeria, Reports of the Constitution Drafting Committee containing the Draft Constitution, volume II. (Lagos: Federal Ministry of Information, Printing Division, 1976): 212. 24 See: Towards Civil Rule: Speeches of His Excellency, Lt. General Olusegun Obasanjo in preparation for changing over to civilian government in 1979. (Lagos: Federal Ministry of Information, 1978). 26 Section 3(1), FEDECO Decree. 27 Section 3(2), FEDECO Decree. 32 Section 94. This offence primarily involved the use of a false name in transactions related to the election. 33 Section 95. This offence was committed by ‘corruptly... giv(ing) ... or providing any food, drink, entertainment or provision to or for any person for the purpose of corruptly influencing that person or amy other person to vote or refrain from voting’ at elections. 40 See: L. Adele Jinadu. The Federal Electoral Commission. In: The Nigerian 1979 Elections, Oyeleye Oyediran, ed., 21-22. 41 For text of the broadcast by Chief M. Ani, FEDECO Chairman, see FEDECO recognizes 5 parties. New Nigerian (23 December 1978): 7. 42 These parties were the Great Nigeria Peoples Party (GNPP), National Party of Nigeria (NPN), the Nigerian Peoples’ Party (NPP), the Peoples’ Redemption Party (PRP) and the Unity Party of Nigeria (UPN). 43 Oyeleye Oyediran, Political parties: Formation and candidate selection. In: The Nigerian 1979 Elections, Oyeleye Oyediran, ed., 43-66; also, L. Adele Jinadu, The Federal Electoral Commission, In: The Nigerian 1979 Elections..., 30-35. 44 The nature and background to this controversy, which was eventually decided by the Nigerian Supreme Court, is discussed in part five below. 45 Muhammadu Buhari, Moment of Truth: Collected speeches. (Lagos: Federal Government Printer, 1984): 8, 20-21. 46 Questioned on two separate occasions in 1984 about whether (and how soon) the regime intended to return government to civilians, General Buhari replied that the question had not been considered by the ruling Supreme Military Council, see Sunday Times (29 January 1984): 11. 48 Views of the Federal Military Government on the Report of the Judicial Commission of Inquiry into the Affairs of the Federal Electoral Commission (FEDECO) 1979-1983, in the National Electoral Commission (NEC), Transition to Civil Rule, Laws and Materials on the Electoral Process. (Lagos: Federal Government Printer, 1990): 314, hereafter called the Views on the Report of the Babalakin Commission. However, the regime could not inaugurate the commission before it was overthrown on 27 August. The commission was eventually inaugurated by the incoming regime of General Babangida on 28 October 1985 which received its report on 14 November 1986. 49 See, Tunji Olagunju, Adele Jinadu and Sam Oyovbaire, Transition to Democracy in Nigeria. (Ibadan: Safari Books (Express) Ltd with Spectrum Books Ltd, 1993): 71. 50 General Babangida was the first and, so far, the only military ruler in the history of Nigeria to rule under the designation of ‘president’. All of Nigeria’s other military rulers have been known as ‘head of state’. See Constitution (Suspension and Modification) Decree no. 17 of 1985 which also created an Armed Forces Ruling Council (AFRC) to replace the Supreme Military Council (SMC), as the highest policy and law making organ of the new military administration. 51 Interview with Time magazine to mark 100 days in office, see Tunji Olagunju, et al., Transition to Democracy..., 72. 52 Better known as and hereafter called ‘Politburo’ or ‘the bureau’. Dr. Ola Balogun resigned from the bureau before it could complete its work while the bureau decided to drop Dr. Edwin Madunagu from its membership for allegedly leaking confidential bureau documents to the media. Thus, the membership of the bureau was reduced to 15. 53 Awa U. Kalu, The democratization of Nigeria..., 51. 54 For a fuller discussion of the report of this committee, see Tunji Olagunju et al., Transition to Democracy..., 96-107. 56 See Newswatch (Proscription from Circulation Decree) 1987. The magazine was proscribed for its issue of 6 April 1987 which published extensive excerpts of the report of the Politburo under the caption ‘Third Republic – A new political agenda’. 59 Itse Sagay, Disappearing act: Nigeria’s bumpy road to democracy. Liberty (vol. 4, no. 1, April 1993): 11. 60 Section 9(1). The Transition to Civil Rule Tribunal, as it came to be known, was constituted with five persons, including a serving or retired judicial officer of any of the superior courts of record as Chairman and ‘four other members of whom one shall be a serving member of the Armed Forces’, [s.9(2)(b)]. 63 See Transition to Civil Rule (Political Programme) (Amendment) Decree nos 14, 19, 26 and 27 of 1989; Transition to Civil Rule (Political Programme) (Amendment) Decree no. 19 of 1992; Transition to Civil Rule (Political Programme) Amendment (No. 2) Decree no. 22 of 1992; Transition to Civil Rule (Political Programme) (Amendment) (No 3) Decree no. 52 of 1992. 65 Section 2(2). This provision implements the views of tne regime on the Report of the Babalakin Commission concerning the age of the Chairman and members of the Electoral Commission, see Views on the Report of the Babalakin Commission.....para 33, p. 322. 69 This particular amendment was effected following the replacement of the first Chairman of NEC, Professor Eme Awa, by Professor Humphrey Nwosu who was less than fifty years at the time of his appointment. See Civil Liberties Organisation (CLO), Executive Lawlessness in the Babangida Regime. (Lagos, March 1991): 11. 71 Decree No. 15 of 17 May 1989. Also later amended by the Local Government (Basic Constitutional and Transitional Provisions) (Amendment) Decree no. 28 of 1989. 72 In Adegbenro v. Akintola  AC 614, the Judicial Committee of the Privy Council held in an appeal from Nigeria that this expression (‘if he is satisfied’) imported a subjective conferment of power and there was no restriction on the range of sources or materials from which a donee of power conferred in these terms could draw in determining whether and when to exercise such powers. 73 Section 34. This power was exercised in at least three verifiable cases. In one instance, a state military governor refused to swear-in two elected local government chairmen in defiance of a court order requiring him to do so. In another case, also in 1989, the regime exercised powers to sack the elected chairman of the Enugu local government area for ‘constituting himself into a security risk by his actions, utterances arid activities’. See, The African Guardian (31 July 1989): 16. 74 By Decree nos. 14, 20, 23 and 63 of 1991. For a full discussion of those elections, see, Civil Liberties Organization, Report on the Local Government Elections of December 8 1990, (Lagos, December 1990). 76 See, for instance, the Participation in Politics and Elections (Prohibition) (Amendment) Decree no. 9 of 1989. 78 See, Chukwuemeka Gahia, Human Rights in Retreat: A report on the human rights violations of the military regime of General Ibrahim Babangida. (Lagos: Civil Liberties Organization, 1990): 66-70. 79 Reflections on the National Agenda, speech at the 10th graduating ceremony of the National Institute for Policy and Strategic Studies, Kuru on 22 October 1988, published in Portrait of a New Nigeria: Selected speeches of IBB. (Precision Press, date unstated): 199-200. 80 Transition to Civil Rule (Qualification to Participate in Politics and Elections) Decree no. 52 of 1991. 81 See, The Constituent Assembly Decree no. 14 of 20 April 1988 and the Constituent Assembly (Dissolution) Decree no. 13 of 3 May 1989. 82 13 political associations initially applied for registration but NEC recommended only six of them for registration. 83 See Transition to Civil Rule (Political Parties Registration and Activities) Decree no. 27 of 1989. See also, the National Electoral Commission (Amendment) (no. 2) Decree no. 37 of 11 December 1989. 84 Civil Liberties Organization (CLO). An endangered transition. Campaign for Democracy Bulletin (no. 2, September 1991): 5. 87 See States (Creation and Transitional Provisions) (no. 2) Decree no. 41 of 27 August 1991; Also Civil Liberties Organization (CLO), Annual Report on Human Rights in Nigeria, (Lagos: CLO, 1991): 57-61. 93 Transition to Civil Rule (Disqualification and Prohibition of Certain Presidential Aspirants) Decree no. 54 of 1993. Following the annulment of the presidential election, this decree was repealed on 26 June 1993 by the Transition to Civil Rule (Disqualification and Prohibition of Certain Presidential Aspirants) (Repeal) Decree no. 42. 94 See Presidential Ejection (Basic Constitutional and Transitional Provisions) (Repeal) Decree No. 39 of 22 June 1993. 95 For a fuller account and analysis of the sequence of events which led to the annulment of the Presidential elections, see B.O. Nwabueze, Nigeria 93: The political crisis and solutions. (Ibadan: Spectrum Books, 1994): 38-54. 97 Sections 2 and 3 of the Nigerian Security Organization Decree, No. 16 of 24 March, 1976. This decree was amended once by the Nigerian Security Organization (Amendment) Decree no. 27 which was made on 4 April, but given retroactive effect to 24 March 1976. 99 National Security Agencies Decree no. 19 of 5 June 1986, now Cap. 278, Laws of the Federation, 1990. By virtue of Section 3(2) of the Decree, the president enjoyed joint control over the DIA with the defence minister and chair of the Joint Chiefs of Staff. 102 State Security (Detention of Persons) Decree no. 2 of 1984, now Cap. 414, Laws of the Federation, 1990. 103 See generally, Chukwuemeka Gahia, Human Rights See also the Annual Reports on Human Rights in Nigeria published by the CLO. 104 M.A. Tokunbo, Labour Movement in Nigeria: Past and present. (Lagos: Literamed Publications, 1985): 94. 106 The commission was headed by Hon. Justice Duro Adebiyi and had three other members, see, M.A. Tokunbo, Labour Movement..., 88. 109 These comprised of 42 junior staff associations, 19 senior staff associations and 9 employers associations, see Government Legal Notice no. 92 of 1978. 111 These included, the National Union of Nigerian Bank Employees, Shell-BP and Allied Workers Union, Shell-BP Senior Staff Association and the Pan Ocean Branch of the Consolidated Petroleum Chemical and General Workers Union of Nigeria. See Government Legal Notices nos. 44 of 1976, 55 and 57 of 1977. 116 For a full account of the violations suffered by trade unions during the Babangida regime, see Chukwuemeka Gahia, Human Rights in Retreat: A report on the human rights violations of the military regime of General Ibrahim Babangida. (Lagos: Civil Liberties Organization (CLO), 1990): 76-80. 118 Better known as the ‘Ali Must Go’ Affair after the then federal education commissioner, Col. Ahmadu Ali. 119 See J.D. Ojo, Students Unrest in Nigerian Universities: A legal and historical approach. (Ibadan: IFRA & Spectrum Books Limited, 1995): 43 -69; also J.D. Ojo, Law and University Administration in Nigeria. (Lagos: Malthouse Law Series, 1990): 49-66. 122 Teaching etc. (Essential Services) Decree 1993. For a fuller discussion see, Abdul Raufu Mustapha, The state of academic freedom in Nigeria. In: The State of Academic Freedom in Africa. (Dakar: CODESR1A, 1996): 103-120. 123 See: Keynote address by Professor H.N. Nwosu, Chairman of the National Electoral Commission (NEC), at the Bi-ennial Law Week of the Nigerian Bar Association, Lagos, February 12 1990, In: National Electoral Commission, Transition to Civil Rule: Laws and materials on the electoral process, 307-313. 126  2 Nigerian Weekly Law Reports (Pt. 176), 732:746-747. See also, National Electoral Commission and Another v. Nzeribe, supra. 128 The Presidential Election Tribunal and the Supreme Court refused to admit these statements in evidence during the proceedings. 130 See Awolowo v. Shagari  Plateau Law Reports, 189, p. 206. The court further held by a 6-1 majority that even if it was wrong in its interpretation of two-thirds of the states of the Federation, it would still have upheld the election of Alhaji Shagari as having been organized in substantial compliance with the electoral decree. 132 The text of the official statement announcing the annulment of the election is reproduced in Ogaga Ifowodo, Annual Report on Human Rights in Nigeria 1993 (Lagos: Civil Liberties Organization): 168-69. 137 For a fuller account of the role of the legal and judicial process during the Babangida transition, see, Ayo Olanrewaju, The Bar and the Bench in Defence of Rule of Law in Nigeria. (Lagos, Nigerian Law Publications, 1992). 142 This paper was written in 1996; Chief Abiola has since died in detention on 7 July 1998; Abacha died before him on 8 June 1998. Most of the political detainees have since been released. 143 See generally, Nigeria: The dawn of a new dark age, human rights abuses rampant, Nigerian military declares absolute power. Human Rights Watch (vol. 6, no. 8, 1994). ODINKALU, Chidi A. The Management of Transition to Civil Rule by the Military in Nigeria (1966-1996) In : Nigeria during the Abacha Years (1993-1998) : The Domestic and International Politics of Democratization [en ligne]. Ibadan : IFRA-Nigeria, 2001 (généré le 23 avril 2019). Disponible sur Internet : <http://books.openedition.org/ifra/634>. ISBN : 9791092312089. DOI : 10.4000/books.ifra.634. Odinkalu, Chidi A. “The Management of Transition to Civil Rule by the Military in Nigeria (1966-1996)”. Amuwo, ‘Kunle, et al.. Nigeria during the Abacha Years (1993-1998) : The Domestic and International Politics of Democratization. Ibadan : IFRA-Nigeria, 2001. (pp. 57-99) Web. <http://books.openedition.org/ifra/634>. AMUWO, ‘Kunle (dir.) ; BACH, Daniel C. (dir.) ; et LEBEAU, Yann (dir.). 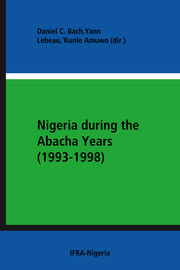 Nigeria during the Abacha Years (1993-1998) : The Domestic and International Politics of Democratization. Nouvelle édition [en ligne]. Ibadan : IFRA-Nigeria, 2001 (généré le 23 avril 2019). Disponible sur Internet : <http://books.openedition.org/ifra/623>. ISBN : 9791092312089. DOI : 10.4000/books.ifra.623.